The Panbo climate computers have been designed in cooperation with Siemens and Honeywell. The philosophy behind this cooperation is the application of worldwide knowledge on climate control to the mushroom industry. Siemens and Honeywell have a great experience and reputation in manufacturing hardware for climate control systems. Panbo Systems BV has a lot of practical knowledge about the climate for mushrooms and compost. Together they combined their knowledge to develop the most innovative new climate computer in the mushroom industry. Panbo has a computer system for growing rooms (Panbo 600 Grow Computer), phase I composting bunkers (Panbo 400 Bunker Computer) and phase II and III composting tunnels (Panbo 500 Tunnel Computer). The Panbo climate computers are designed using a very straightforward concept, simple to use and allowing the programs to be easily extended with upgrades. Panbo is also able to make an on-line connection with the computers to give their clients professional help whenever needed. With our computer system we can measure the evaporation in the room by hanging dry and wet bulb sensors in the path of the incoming air duct, and by taking a reading in the growing room as well. You get the extent of evaporation using the difference between the two measuring points. The controls from Panbo include a figure for evaporation, expressed in grams of moisture per hour per m2. Controlling the evaporation improves the quality and shelf life of the mushrooms. Especially in the 3rd flush the quality and the quantity of the mushrooms are higher, and it reduces the risk of bacterial blotch considerably. With evaporation-based control ventilation is reduced to a minimum which saves a lot of energy. A heating system using the residual heat produced by the cooling. A cooling system in which water is cooled via a set of pipes instead of condensers with a high energy consumption. Panbo has developed a reliable, economical, and user friendly computerized climate unit for the bunkers, compost tunnels, and growing rooms. The new Panbo growing room unit has only one damper is stead of the traditional two dampers. This reduces the costs of the unit and results in a better mixture of the air. The front side is executed as a door allowing easy access to the inside of the unit. This makes it possible to clean the unit regularly with a high pressure cleaner. Also the filters can be replaced effortless. The Panbo tunnel unit is equipped with the unique “T-damper” construction. 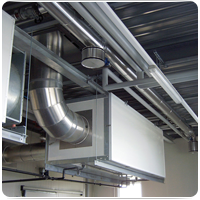 This allows the recycling-air, and the fresh and exhaust air to be regulated with one air control damper. This makes any overpressure security unnecessary.